Before I dive into a full Lumonol review, I want to give readers here at MyFavDeals a bit of background – not only about my particular reasons for buying and trying the product, but also about WHY we bought it (instead of requesting a free sample or discount). Now, of course because we are in the business of marketing products and services, we definitely do sometimes receive discounts or free trials of a product from a vendor – but that is not the norm for us. And this is one of those times where we purchased the product at full price. And that reason is so that we can give our truest impressions without feeling any type of stress to simply gush about how wonderful a product is. There are enough reviews out there like that already, and so want to report to our readers some of the type of feedback that can only really be a result of an actual purchase – from the moment we visit the website to the moment we complete our experience with the product or service. So, we will each be receiving our supplements in a few days, and we will each use it for about a month. Then we’ll put together the full review. During that month, we will be sharing notes and anything that we discover along the way! Let’s have a quick look at one of the reasons why we are so intrigued about Lumonol to begin with. 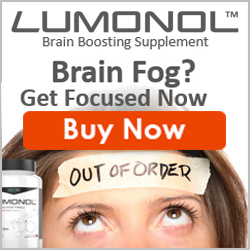 I would have to say that Martin pretty much started it, because he has ordered a number of “brain supplements” in the past, and he’s the one who brought Lumonol to my attention to begin with. It has a good reputation, and its “nootropic stack” appeared to us to be fairly well “itemized” if that makes sense. Martin was sure that the standard Lumonol blend would be good for him, so that’s what he ordered. I went back and forth between whether or not to order the “Wisdom” blend, designed for people 60 and over. I’m 57 at the time of this writing, so I thought that Lumonol Wisdom might be a good choice. However, after I compared both, I, too decided on the standard product. I did add the Lumonol Smart Drink powder to my order (it mixes in water) – so that I could split my doses and adjust how much I’m taking a little more easily. What I mean is that let’s say I take one capsule in the morning, and then want to take the second dose a little later, if I want to take say the equivalent of only half a tablet, I can do that by using less than a full scoop of the powder. Hopefully that makes sense! And, the reason for this is that Lumonol contains Guarana, which is part of the energy stack, and is a natural form of caffeine. I’m going to carefully watch how I feel with a supplement that has caffeine. I’m not a heavy coffee or tea drinker, so this is going to be something I am carefully going to note. Another thing I want to point out is something called Neurogenesis. If you haven’t heard about this – where our brains are able to grow new neurons, you may find this TED Talk by Neuroscientist Sandrine Thuret quite interesting. Ms. Thuret explains some of the factors affecting our brains. Because I have made the assumption that you are at this article because you are interested in brain health, this is something that you may wish to view. The video is only 11 minutes long, but is chock full of very usable information. I’ve tucked the video down the page, just below this article. I will be back with our impressions and a discussion about what differences – if any – I can detect after using Lumonol for a while. Please check back soon! Our Lumonol Review is now Live! (In the meantime, if Lumonol ever offers coupon codes or deals, we’ll post them in THIS section here.